All this talk about grilling made me think of pollo a la brasa. (I actually stopped writing this to go to El Pollo Rico. Now that my belly is happy and craving is satisfied, I can continue to write.) So where was I? Right. Chicken. Kiss said, “Look at other cultures and how they grill. Asian satay. Pollo a la brasa.” He went on to talk about making the chicken on the grill, minus the rotisserie: “Split the chicken in half across the back, that’s called butterflying.” It’s also referred to as spatchcock. “On low heat, set the grate up high, and with the skin up, cook two to three hours. The pollo a la plancha – chicken on the grill – method works for other flavor profiles such as Caribbean jerk chicken or chicken paprikash. Make a tandoori rub or a tikka masala chicken. And it wouldn’t be summer without grilled ribs! Rub down baby back ribs and put them on a 250-degree grill for two hours. Wrap them in foil, drip in some beer or apple juice, seal the foil packet and cook another 1 ½ to 2 hours. When the rib bone spins inside the meat – are you drooling yet? – they’re ready. Be warned, Chef Michael said, you don’t want them falling apart. 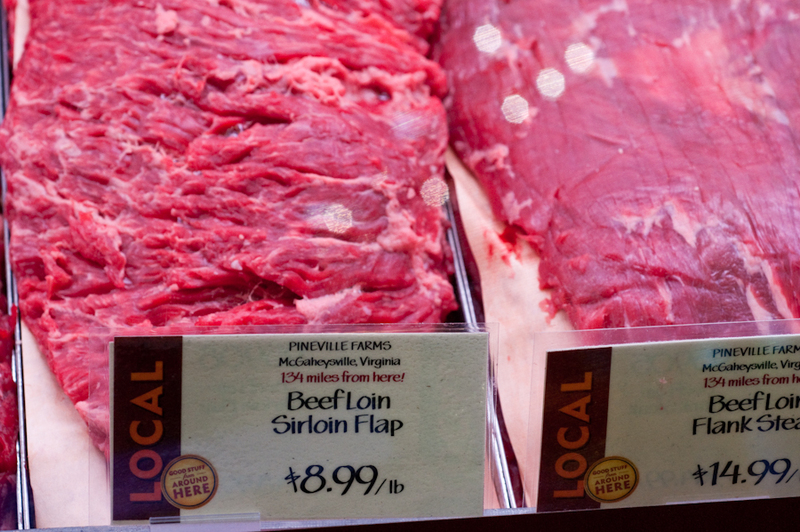 Grass-fed beef is beefier in flavor and contains less fat. But fat also means flavor, so Whole Foods provides consumers with both options. Online barbecue forums are a great way to talk to experts and get their opinions. Young lamb is very tender, and Kiss encourages shoppers to get rid of misconceptions about lamb being tough. Though he says, “A roast is a roast is a roast,” a crown rack might be intimidating, so try butterflied lamb on grill. Serve it on pita with herbs, cucumber, tzatziki sauce. Why not try grilling sausages? Heat the grill to medium/medium-high heat and cook as slow as possible, perhaps as long at 15 minutes. Know those “hard things” you bite down on in some sausages? Well, Chef Michael said that those are fat globules that weren’t cooked long enough, and did not render during cooking. What’s your favorite type of meat? What’s your favorite way of cooking it? If you’re a vegetarian, what are your preferred meat alternatives? I can’t believe I’m saying this, but nice bokeh on that meat.